Time After Time pits H.G. Wells against Jack the Ripper in 1979 San Francisco. For me, this week we really do have a Forgotten Film. I recorded Time After Time the other day knowing I had seen it somewhere along the way, though not in the theater when it was released. It was released in late August 1979 when my work schedule was pretty hectic and I was dating the amazing Sandi. Two months later, Montgomery Ward moved me from San Antonio to Laredo, Texas, which was like going to the third or fourth level of Hell. Anyway, I knew the basic premise. 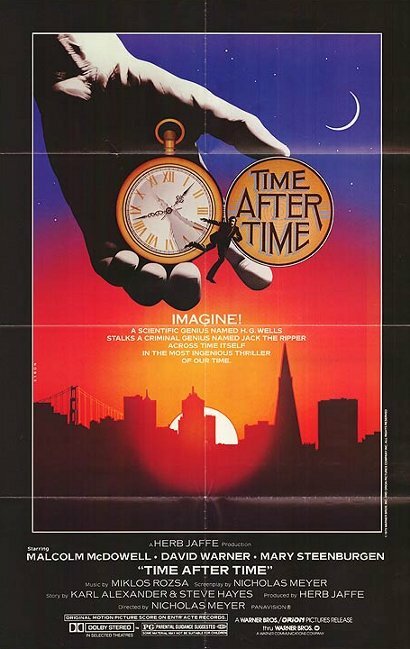 Jack the Ripper steals H. G. Wells’ real time machine and goes to 1979 San Francisco. Wells follows and tries to stop him. Sounds like a film I would really love. But I didn’t remember hardly anything about it before I screened it yesterday. As I watched the film, I did not recall anything specific about it. I really think that I must have never seen it, but I knew enough about it to think I did. I gave you the basics. Dr. John Leslie Stevenson (David Warner) is a London doctor in 1893 with some truly nasty habits which include slicing up prostitutes in Whitechapel and sending notes signed “Jack the Ripper.” He is a friend of H. G. Wells, visiting regularly for dinner and chess. As the film opens, Stevenson commits one of the murders on his way to Wells’ (played by Malcolm McDowell) for dinner. Wells has something to show his friends on this particular evening – a working time machine. His is reluctant to test it yet, but he shows his guests the basic operations. A truly bad move on his part. The demonstration is interrupted when police arrive at the house looking for the murderer. Clues have led them to the area and while there, they discover Stevenson’s medical bag contains some bloody ephemera and souvenirs from the murder. The house is immediately searched but Stevenson cannot be found. When the police leave, Wells suddenly has a revelation and going into his basement, he finds the time machine is missing. As he is watching, the machine returns empty, using a recall method that Wells had installed. He peers into the cab of the machine and finds it has been set for 1979. He hurriedly borrows money from his housekeeper and uses the machine to travel to the future. Wells has imagined a utopian future where logic and reason have removed war and crime from the human condition. Not taking the Earth’s rotation into account, Wells arrives in San Francisco instead of London as he expected. His Victorian clothes and manners add a humorous effect to the film. He realizes he has no easy way to find Stevenson, so he goes to a jeweler to sell some of the jewelry but fails in this attempt since the jeweler wants some form of identification. He eventually ends up at a pawn shop where such trivialities are not a matter of concern. Realizing that Stevenson will have to convert his British currency and coins to American dollars he goes from bank to bank to try and find a clue. At the Chartered Bank of London, he meets the Foreign Currency Exchange Officer Amy Robbins (Mary Steenburgen), who has handled a transaction for Stevenson the day before and has recommended the Hyatt Regency to him. Wells tracks Stevenson there. A fight ensues and Stevenson flees. With wells in pursuit, the two ran for an interminable period before Stevenson is hit by a car. He is tracked to the hospital where Wells is told that Stevenson is dead. Amy has flirted with Wells and aggressively pursued him while he was at the bank. So when he returns to the area, she picks him up and takes him to lunch. They tour the city and end up as lovers. Soon it becomes apparent that Stevenson is not dead and, when he exchanges money again, he figures out that Amy was the one who set Wells on his trail. I’ll save the rest for you to see for yourself. It’s kind of fun. McDowell and Steenburgen worked very well together, and they obviously enjoyed their time together, as they were married the next year and stayed together for ten years. Much of the film’s charm comes from the reactions of a highly educated and fairly liberal Victorian writer to the world of 1979. McDowell plays Wells almost a naïf in his reactions to the knowledge of two (!!!) WORLD WARS as well as other wars. And the ease with which someone in the U.S. could procure a firearm. And the idea of Women’s Liberation. All in all, I enjoyed the film, seeing it for the first time since I no longer recall the early viewing. And I loved the soundtrack from one of my favorite composers, Miklos Rozsa. It was reminiscent of some of my favorites of his work, like El Cid and Ben Hur. According to Slashfilm.com, Time After Time has been picked up by Kevin Williamson of Scream fame and ABC has picked up the series. No idea when this will be happening, but the article was from September 2015. Of course, I had no idea of this when I selected the film for viewing. It had been a part of a science fiction marathon on TCM on New Years’ Day. It appears to be readily available for reasonable prices if you want to find it. If you have not seen it, give it a look. If you saw it more than 30 years ago and remember nothing about it, also give it a try. And, as always, remember my taste is in my mouth and your mileage may vary.